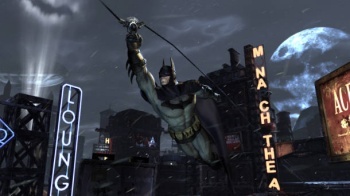 No car, plane or boat is a patch on Batman, according to Batman: Arkham City director Sefton Hill. If you were hoping that Arkham City might let you cruise the streets in a custom-built, high-performance, justice-bringing rocket car, then I'm afraid you're in for some disappointment. Batman will be leaving the keys to the Batmobile at home - and that goes for the Batboat and Batplane, too. Speaking in the latest issue of British videogame magazine GamesTM, Hill made it clear that there would be no playable vehicles in the game. Rocksteady thought of Batman as the "ultimate vehicle," he said, and so the focus had been on his athletic prowess and getting around the city under his own power. Considering the plot of Arkham City - the former warden of Arkham Asylum has walled off a section of Gotham City's slums and turned it into a giant prison, one where the prisoners are pretty much left to their own devices - it actually makes sense that there wouldn't be any vehicles. The Batplane and Batboat would likely be of limited use, and cruising around in the Batmobile would probably generate the wrong kind of attention. Better to go in quiet and undetected than advertise your presence with an ostentatious car. Screenshots show that the glider cape and the line gun are making a return in Arkham City, and previous interviews have revealed tricks like smoke bomb escapes and combining the cape and grapnel for a kind of slingshot glide. Arkham Asylum did a great job of putting you in the Dark Knight's enormous, bulletproof boots, but leaping from rooftop to rooftop on the meanest Gotham streets around, sounds like a Batman experience plucked straight from the movies or comic books. Batman: Arkham City comes out for PC, PS3 and Xbox 360 in late 2011.